Hi every one. We are going to do a day trip out to box canyon in wickenburg this weekend to scout for a good camp spot and do some riding in the area. if you want to come let me know on which day works better. Saturday or Sunday. I'm leaning towards Sunday. 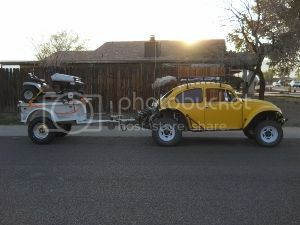 It will be a buggy trip. Looks like Sunday is the date. This weather is KILLING me! My car starts, Idles, and revs. All I have left to do is take it some place ( river bottom) and run it out and see how it does and make any final adjustments to the fuel injection system. Right now I am also making my trailer road worthy. Let a friend use it for a couple of years nothing major.